Jess and I left our hotel extra early to arrive at the Children's Author Breakfast. At first we had a hard time finding a table that wasn't reserved by a publishing house. It was starting to feel hopeless when we found a table of YA bloggers including Kristi from The Story Siren, Cat from Beyond Books, April from Good Books and Good Wine, Anna from Anna Reads, Tara from Fiction Folio ,Tara from Hobbitsies and one or two other bloggers I know I'm forgetting. We were sitting closest to April and I just have to say she is so kind and great--it was awesome meeting her. The breakfast was nothing special--a simple continental of bagels, muffins, orange juice and coffee.Sitting on our chairs were copies of all the speakers books along with some swag. Jess and I already had The Fault in Our Stars, so we ended up giving them away to other bloggers who weren't at the breakfast. 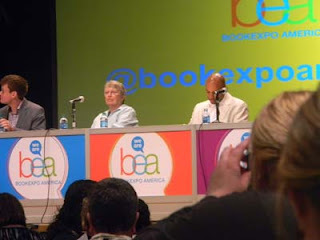 The authors speaking were, Chris Colfer, John Green, Lois Lowry and Kadir Nelson. They were introduced by medal wearing Walter Dean Meyer-- yep, there was a lot of talent on that stage. Chris Colfer MC'd the breakfast and was adorable. He discussed how he has been writing his book, The Land of Stories since his childhood. He showed some of the first drafts and maps from the book he created as a child. After watching Vlog Brother videos for about a year and a half, I never imagined I would ever see John Green speak. He was amazing, but was a bit more low-key than he appears in the videos. I have to admit I agree with him that the publishing industry should stick with what it's good at--telling stories and not looking for some high tech new way to reinvent the book. Lois Lowry, just Lois Lowry. It was such an honor to be in her presence, I mean who hasn't read The Giver ? I remember reading it in middle school and it blew my mind. She discussed how she wrote The Giver and all of it's companions to answer the question "Why do people do bad things ?" She received a standing ovation and I really want to read The Giver and all its companions this summer. Kadir Nelson has some AV issues with his presentation, but you could care less once you've seen his illustrations. He is so talented and has illustrated some amazing children's books. Also a funny tidbit, John Green made a reference to Tumblr and reading reading fan fiction and the librarians or publishing execs or something at the table next to us had no idea what he was talking about. It was all over their faces. After breakfast it was back to the floor. 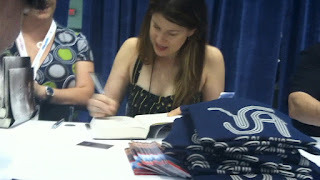 My one goal for the day was to go to Maureen Johnson's signing and have a good spot in line. The signing was a couple of hours away so, I popped over to Chronicle Books and was first in line to have a copy of Cake Pops signed by Bakerella. I waited around for the Marueen Johnson singing and finally Taschima from Bloody Bookaholic and Briana from The Book Pixie had started the line--I was third ! Waiting in the line adjacent to ours was Becca Fitzpatrick, the author of Hush,Hush and she kindly agreed to take a picture with Briana and Taschima. I haven't read Becca's books, but she is a NYT besteller and it was crazy to me that she waited in line like everyone else. I even saw Walter Dean Meyers walking around the autographing area wearing his medal. I mean, it was nice to see the authors on such equal ground with the readers. There was a little kerfuffle with Maureen being late, because there were two different time listed, and she was quick to set up and start signing. I really hadn't planned anything to say to her, but when I showed her my badge to get my name spelling she said she knew people in Richmond. I also got a YA Saves shirt. After that I found Jess who had survived the Harper Collins Dark Days line. We rested our feet with Ashley from Quixotically Uncharted, A.C Gaughin, the author of Scarlet, Miranda and Tara. Jess and I then got trapped in the Reached bubble before heading back to the bus stop, books in tow with plenty of good memories. BEA was a great experience, if not a completely exhausting one. I don't know a lot of people who are into books like I am, so to be around so many bibliophiles was amazing. Usually, reading and books is the 'other' or 'extra' thing in your life. At BEA I could talk to people about books and blogging and never find out what they do for a living or anything. There are so few opportunities where books take center stage, so I enjoyed my time there and can't wait for next year. Awww, it sounds like you two had a great time at BEA! It must have been amazing to see all the great (and quite funny) talent at the breakfast! Great picture of Maureen Johnson - she's so hilarious on Twitter, and although I've only read one of her books, I think she's one of my new favourite authors. I also love your Reached photo op, LOL! Thanks for the comment! It was great to see all the talent on one stage--it definitely inspired me as a reader. It was awesome to meet you as well ! 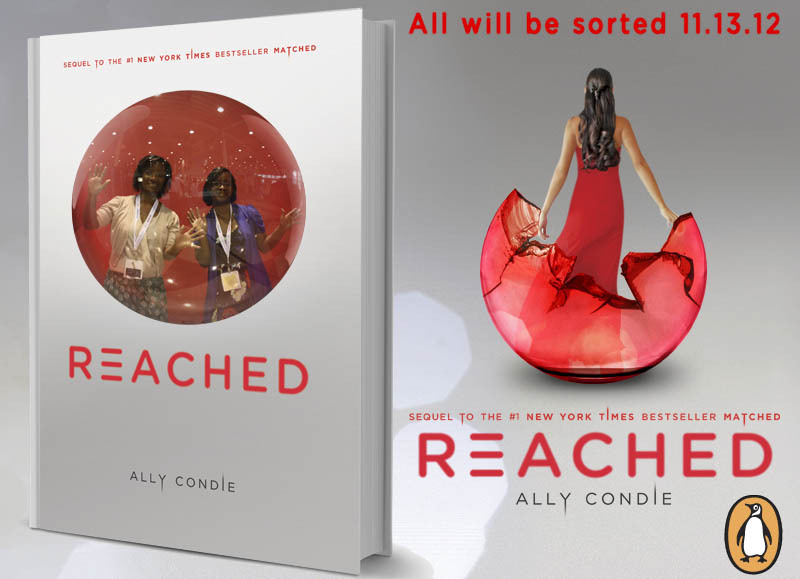 We were so glad we found a table of other YA bloggers to sit with. We have a great time, it was a very positive first BEA experience. Aww! Sounds like you girls had a truly amazing time! I adore Maureen Johnson. She is so amazing and sooo funny! If you ever have the oppurtunity to go to her signing and hear her speak....DO IT! Even if you don't get anything signed. just listen to her speak. You won't regret it!